Getting to the top of the search engines is harder than ever, that's why you need a Search Engine Buddy and a team of SEO Gurus who do all the hard work for you. With Search Engine Buddy you get automated software and reports, PLUS a team of SEO Gurus with extensive industry experience. Sit back and watch the results as you achieve the top spots on Google, Bing, Yahoo, MSN and other engines for less than $2 a day. With the Search Engine Buddy Program you get all the SEO components you need to make your website rank well, including more than 500+ new back-links per month with full reporting, On-Page Search Engine Optimisation Overview, Off-Page Search Engine Optimisation, Directory Submissions, Media Releases, Online Article Writing and Submissions, Independent Reviews, In-depth Social Networking and Forum Posting and Submissions, Competitor and Keyphrase Analyasis including summary report, and the creation of up to three specifically designed and SEO optimised landing pages. 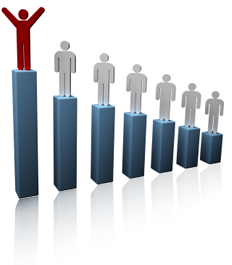 Search Engine Buddy GUARANTEES a minimum of 3 TOP SPOTS and a minimum of 10 FRONT PAGE results. Yes, Search Engine Buddy is that good, if it doesn't achieve the results promised within a yearly subscription, SE Buddy will continue to work on your SEO Campaign for free until it does, no strings, no catches! Best of all, there are no contracts and no committments. You can try it for one month or one year, it's up to you. Watch your search engine results soar. Cancel anytime and pay nothing more. Search Engine Buddy will provide you with regular updates and reports so you can track your progress and see the fantastic results Search Engine Buddy will achieve for your website. Unlike many SEO tools, Search Engine Buddy isn't just a one trick pony, it keeps running ensuring ongoing success for your website and utilises multiple SEO techniques so you can actually see the rapid results achieved, it conducts multiple SEO friendly activities on your behalf as if you were doing them yourself in a natural way; only it does them much faster and more effectively than you could yourself. Search Engine Buddy doesn't just achieve good results, Search Engine Buddy has been designed to ensure your website gets to the very TOP of Google and other major search engines. With an affordable price, it's Small Business SEO that makes sense. SE Buddy is so good it's the only tool we used to promote the SE Buddy website itself for organic searches! The Search Engine Buddy Program is the best marketing and advertising money a small business can spend; it will ensure you achieve extensive search engine penetration, top positions and continue to achieve ongoing search engine traffic over a period of years. Search Engine Buddy and our team of professional SEO Specialists, will tailor the package to your content, your products, your services and information to ensure that you achieve targeted, specific traffic from the search engines. This means a far higher conversion rate, more traffic and a very impressive Return On Investment (ROI). A successful Search Engine Optimisation (SEO) Campaign requires in-depth analysis of your website, your online competition and your target keyword phrases. Additionally, the campaign must focus upon On-Page optimisation to ensure that your website has search engine friendly text, structure and design, good keyword density, your site utilises meta tags, alt tags, header tags and other SEO friendly components. The Search Engine Buddy Programs also fully utilise Off-Page optimisation including article submissions, online media releases, forum post ing and social networking, plus it includes an effective, fully managed manual back-linking campaign to increase your perceived standing in the eyes of the search engines. Effectively, every back-link counts as a vote for your website, telling the search engines that other websites value your content, services, products or offerings; this in turn increases your status, respect and position within the search engines. Search Engine Buddy provides "White Hat" SEO techniques only. Campaigns see very quick results in the major search engines. In general, the less competitive the industry for your keywords, the quicker you will see results. You will see significant increases in search engine penetration and will see front page results on Google, Bing, Yahoo, MSN and other leading search engines well before your SEO campaign has completed. Additionally, even after the campaign is completed, you will continue to see ongoing results based on the extensive work Search Engine Buddy has carried out for you which will result in improved placements in the medium to long term. Get started on your own personalized and effective SEO campaign with Your Search Engine Buddy. Search Engine Buddy will get you to the top of Google, Bing, MSN, Yahoo, AllTheWeb and all the other major search engines and help keep you there! There are many SEO companies and individuals with little or no experience who rely on and employ "Black Hat" techniques to achieve rapid results. These techniques include "cloaking", "redirection", "false linking", "paid links", "spamming content", "link farming", "forum spamming", "hidden and invisible text" and many more. Initially, these may look like quick results. However, the search engines do not tolerate these techniques. This means that when (not if) your site is found to be using one or more of these techniques by the search engines and or your competitors (who will immediately report you to the search engines) your website will be delisted and stop showing up in search results completely. These types of techniques will cost you website traffic, search engine respect and in the long run, a lot of money for a negative result. Don't trust your Small Business SEO Campaign or your website's valuable status within the search engines to someone who doesn't have extensive experience with "White Hat" Search Engine Optimisation practices and is unwilling to share real customer results. Sugar Dreams Cakes was a brand new startup business with no online presence and zero traffic. 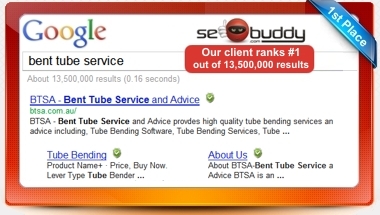 By utilising the power of SEBuddy they achieved almost immediate penetration and went from zero front page results on the major search engines to 54 top spots (Ranked 1st) in the major search engines. "The website results are fantastic. Thanks so much for all your hard work!!!" 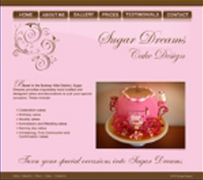 Check out the completed SEO Campaign Report for Sugar Dreams Cakes. Not only did Sugar Dreams rise rapidly to the top of all the major search engines for all their important keyword terms, they also saw immediate increases in targeted traffic which converted to sales and paid for an annual SEBuddy Campaign in just 10 weeks! 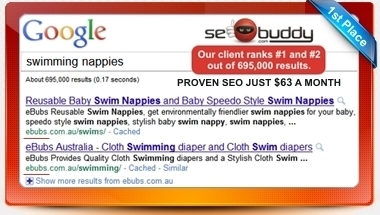 The eBubs project brief was simple; achieve the top spot on the major search engines for "Swimming Nappies" a new product line they were launching. 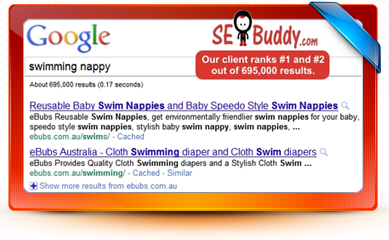 seBuddy achieved the top spot on Google, Bing and Yahoo within two months but didn't stop there. 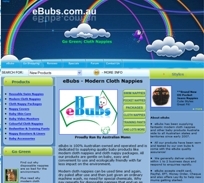 Within 6 months eBubs had 35 top spot positions in the major search engines vaulting eBubs over their competitors and giving them a distinct online advantage! "We can't believe the results they achieved for our site so quickly. Almost over night we became a big player in the industry. It was incredible! Thank you to all the team at sebuddy!" Hills Pet Nanny had been advertised by word of mouth for years as they had been unable to achieve any significant web penetration in the search engines. That is until they invested in an SE Buddy Yearly Campaign. Within just 3 months of engaging SE Buddy their site had the majority of the top spots for their targeted keywords in and around the Sydney Hills area and had also achieved a rapid growth in targeted traffic. 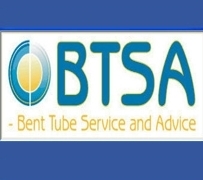 BTSA - Bent Tube Service and Advice is a repeat customer of SEBuddy, ensuring they stay at the top of the search engines for all their main keyword phrases. As a small business, they rely on sebuddy to help make them competitive against much larger companies without the excess spend associated with Adwords and CPC advertising. "My products and services are listed on the first page of search results ahead of the competition! Very happy with the results." SEO Buddy is on special for a limited time only. Take advantage of this comprehensive and effective program for your own website, for a short time you can do it at our discounted rate. Better make it quick though, available for a short time only! Try a monthly subscription and it wont be long before you see your website rocketing to the top of Google and other major search engines. Most customers who sign up for a monthly subscription quickly move to yearly within a few months. 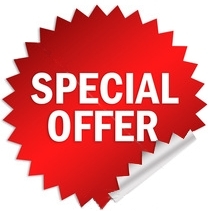 Sign up now and save 10% off the normal price! Search Engine Buddy guarantees 3 x top spots within the major search engines and a minimum of 10x front page in Google keyword results by the end of a yearly campaign or Search Engine Buddy will continue to work on your SEO campaign for free until these results are achieved for your site. Search engine listings update constantly so keyword results will move up and down over time depending upon competition. Ongoing campaigns ensure higher longer term results. As Google has a nearly 70% share of the search engine market and of all search queries conducted online, Search Engine Buddy therefore predeominatly provides examples from Google searches as this is the most competitive arena. Results on Bing, Yahoo and MSN are just as impressive! Copyright © 2011 sebuddy.com All Right Reserved.